“Whether they are historic landmarks or contemporary icons, museums often serve as engines of economic regeneration. IAMFA’s more than 200 members, with over 100 million sqft (9.29 million square meters) around the world, are supporting thriving communities and connecting people with culture,” said Nancy Bechtol, President of the International Association of Museum Facility Administrators (IAMFA). A recent report by the American Alliance of Museums states the total economic contribution of US museums in 2016 amounted to more than $50 billion in GDP, 726,200 jobs and $12 billion in taxes to local, state and federal governments. Not included is more than a million hours of volunteer services every week producing measurable social impacts including education and engagement with community members. In areas where museums are particularly tied to tourism, these cultural institutions play a crucial role in the financial and emotional health of the community. In 2018, the Urban Land Institute (ULI) released Ten Principles of Resiliency. The AAM, through its Museums as Economic Engines report, has successfully applied one of the principles: Build the Business Case. The other principles that resonate well with cultural institutions are: Understand Vulnerabilities, Maximize Co-benefits, Harness Innovation and Technology, and Design with Natural Systems. Since resiliency risks have both design and operational impacts for a museum’s collection and its visitors, below examples illustrate recent advances to prepare a museum for climate events and more sustainable energy management practices. 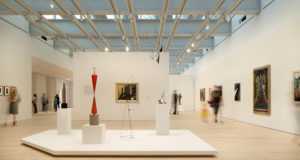 In moving to the Meatpacking district of New York City the Whitney Museum has brought its art collection downtown next to the popular High Line. The expanded space, behind an elegant vertical steel ribbon structure, also meets Local Law 86 standards, which requires 25% energy reduction below local code. In addition to highly insulated facades and articulated glazing, a 75kW reciprocating cogeneration engine with 1,000 gallons of hot water storage, CO2 sensors with outdoor air modulation, airside and waterside economizer, high efficiency modular chillers, and cooling tower optimization reduce energy use. Ultra-low emitting materials, enhanced outdoor air delivery and monitoring, and a building flush-out prior to occupancy add to its indoor environmental quality. The multi-level open spaces, connected by dramatic steel stairs, capture storm water from the terraced roof. The museum, as a result of Hurricane Sandy, has also become one of the most flood resilient structures in New York. At the height of the storm, more than five million gallons of water entered the construction site. That spurred creative thinking to elevate disaster response planning. In addition to designing for LEED Gold certification in which flood plains were respected, the team borrowed from naval architecture precedents: it included 15,500 pound water-tight doors that are 14 feet in height and 27 feet in width. The doors’ quarter circle swing tracks are edged into the concrete floor should they need to be closed on short notice. The Whitney’s public lobby is only 10 feet above sea level overlooking the Hudson River. A mobile wall, an emergency vertical barrier, is another result of post-Sandy design. The wall reduces water pressure along the glazed façade at the ground level and can withstand up to 17 feet of storm surge. The water tank is also set up to receive flood water in an emergency. Climate adaptation design has been prevalent in Florida, where hurricanes are a common occurrence. 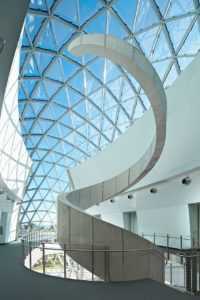 The Dalí Museum in St. Petersburg stood out in blending design and function with the protection of artworks. The Dalí, having been completed in 2011, is equipped to withstand winds of 165 mph, the equivalent of a Category 5, 200-year hurricane, thanks to 18-inch thick, cast-in-place reinforced concrete walls as well as a thick storm resilient roof. All the glass surrounding the museum is laminated, insulated, over 1 ¾ inches thick, and able to resist 135 mph winds and projectile impacts. The indoor spaces contain roll-down storm doors to protect critical areas from damaging winds and water. The galleries and art storage have been purpose built to allow the collection on display to stay in place, avoiding unnecessary relocation handling, in advance of storm surges. While a hurricane resistant building can translate to a fortress-like shelter, The Dalí introduces transparency in the design to welcome visitors. Laminated skylights, framed in steel, provide natural daylighting for the gallery space. Vision glass is protected with hinged metal grates to shield the glazing from projectiles during a storm. Other green design elements include a solar hot water heater for restrooms, efficient HVAC systems as well as advanced building automation systems to control lighting and energy use. Indoor air quality is enhanced by zero- and low-VOC materials. LED lighting is used for the interior and exterior spaces. Cool roof coating, in white and light colors, reduces the heat island effect. The landscape design is largely native Florida vegetation, while permeable pavers on site facilitate storm water drainage and underground filtration. The museum was recently put to test by Hurricane Irma, which wreaked havoc across much of Florida in 2017. Unsurprisingly, little damage was sustained by the building or the art inside. The wildfires of late 2017 were the most rampant in California’s history. In December, the Getty Museum’s hillside was covered with smoke. By design, most of the museum exterior is clad with thick and heat resistant travertine stone. A carbon filtered air-conditioning system pushed air and smoke out of the buildings to protect its inhabitants and vast collection. In San Diego, while the museums in Balboa Park were spared in the 2017 fire, the Sustainability Program of the Balboa Park Cultural Partnership provided community tips to prepare for wildfire safety and preparedness in September of 2017. Guidance includes properly spaced trees near buildings, purchasing fire resistant plants and removing dead shrubs. Two months earlier, Hurricane Maria devastated Puerto Rico. The prolonged power outage meant increased risk to museum collections. Fortunately, the 1,300 artworks at the Museo de Arte de Puerto Rico (MAPR) benefited from backup generators. The building soon became the repository and “cultural vault” for other institutions sustaining physical damage. The round-the-clock art rescue effort after this hurricane and the flood demonstrated the social cohesion within the art community. MAPR, as a Smithsonian Affiliate, was given a $75,000 grant for the purchase of diesel to keep the museum’s power generator operating. While diesel is one critical life line, the lessons learned give museums an expanded lens towards emergency preparedness. There is now a Coalition for the Heritage of Puerto Rico, which will soon release a guide to advise cultural institutions on disaster readiness before the upcoming hurricane season. The Louvre, a former royal residence, is located in Central Paris. It is the second most visited museum in the world, after the Forbidden City Palace Museum in Beijing, with over 8 million visitors per year. Approximately 70% are international tourists with strong spending power. Less publicized, however, is the Louvre’s collection’s approximately 152,000 pieces of artwork located in zones at risk of flooding from the nearby Seine River. A defining natural catastrophe for the city in the last century was the Paris flood of 1910, when the Seine burst its banks by over 26 feet (eight meters). This event shaped disaster preparedness responses for ensuing years. However, despite the construction of artificial lakes upstream, the flooding risk is still very real. Population growth and a densification of underground infrastructure all contribute to Paris’ increased vulnerability. In June of 2016, and again in January of 2018, the Louvre made headlines as rising Seine water levels threatened its premises following torrential rains. Closing museum doors mean immediate economic impact and revenue loss. In 2015, the annual ticket sales for the Louvre were $89 (€72) million, which averages €232,000 euros per day. Financial damage due to closure can quickly add up – the four days of shutdown in 2016 translate to an estimated loss of $ 1.2 (€1) million from ticket sales alone. Additional forgone revenues include those from gift shops, restaurants, tours, and special events. The Louvre is a participant in the PPRI (Plan de Prévention des Risques d’Inondation), a citywide emergency response plan using large-scale simulations. By 2019 one long-term solution will be realized with the Louvre’s $74 (€60) million storage facility in Liévin (about 200 km north of Paris near the Belgian border), where vulnerable artworks currently in Paris will be relocated. Meanwhile, the PPRI also includes a ‘crisis unit’, activated once the Seine reaches a certain water level. The 500-strong personnel has 72 hours to catalogue and transfer artworks out of harm’s way. During the 2016 flood, in 48 hours the PPRI team managed to relocate 35,000 artworks. 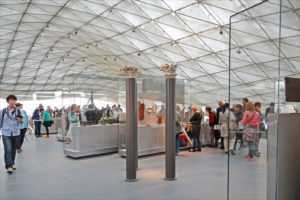 The Louvre has also put in place a system of cofferdams – wooden walls that block doorways and other entry points for water – as well as heavy metal doors and concrete channels. As further reinforcement, four large underground pumping stations, costing $17 (€14) million, will divert flood water back into the 160 year-old Paris sewers. Resiliency work occurs discreetly out of sight at the Louvre, as only a quarter of its 3.9 million sqft (36 hectares) space is open to the public. The museum publishes a sustainability report, which includes a plan to track energy consumption and capital modernization. A more visible example is the new LED lighting in the central courtyard for a reduction of 47 tons of CO2 per year. The total carbon emissions of the Louvre was approximately 8,733 tons in 2014. Measures are in place to reduce 14% of total emissions by 2020. While the museum collection is the foremost concern in any natural disasters, the people side of the equation is just as critical. Most recently, the health and medical community has joined forces in raising awareness of climate related events and human health. The American Public Health Association (APHA) declared in 2017 that Climate Changes Health. Another one of ULI’s Ten Principles of Resiliency is: Understand Vulnerabilities. The health vulnerabilities are worth the attention when cultural institutions are community anchors. Cultural staff who need to labor in compromised buildings to rescue collections or fortify infrastructure are more susceptible to illnesses. Displacement of assets and other museum functions could affect mental health and add to stress. More than mere disaster remediation alone, risk management, health considerations, resiliency and adaptation planning is an indispensable cultural strategy going forward.